Gopala Gopala is an Telugu Multi-starrer Big budget film and it is an official remake of Akshay Kumar and Paresh Rawal starrer Bollywood hit film”Oh My God” about an atheist who sues god. 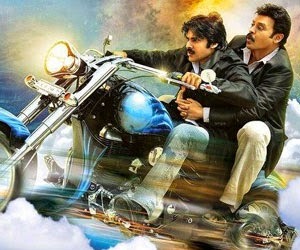 Movie Starring Power Star Pawan Kalyan, Victory Venkatesh, Shriya Sharan and Madhu Shalini It was directed by Kishore Kumar Pardasany who earlier directed telugu films like Koncham Istam Koncham Kastam and Thadaka. Film was produced jointly by Suresh babu and Shrath Marar under the banner of Suresh productions. This is the first time Music director Anoop Rubens composing tunes for Big hero like Pawan Kalyan and he also composing tunes for NTR’s Temper. Anoop Rubens impressed the telugu audience with Manam in 2013. Now, he is coming up Gopala Gopala. Cinematography done by Jayanan Vincent and while Editing handled Gautham Raju. Production company was Suresh Productions and Distribution company was Blue Sky Cinemas. Pawan Kalyan and Venkatesh are eyeing for a hat-trick hit with Suresh Productions and Sharath Marar’s Northstar Entertainments.